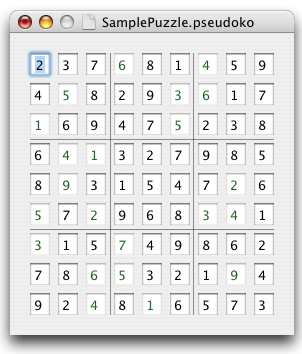 Download Pseudoko - A simple number puzzle matching game. A good example of Key-Value Coding, NSUndoManager and an NSMatrix of NSTextFieldCells coming together. It also lets you create, solve, and save Sudoku puzzles. Xcode 2.4. M.I.T. style license. 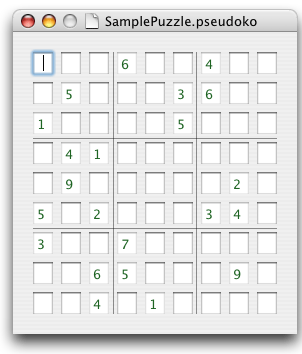 This isn't very interesting or pretty as a Sudoku implementation, what is interesting is the source code. See problems and challenges for an essay on what was interesting about writing this program.